Do you feel your mattress isn’t treating you as well as it should? Are you unhappy with it? Would you like to be more comfortable at night? Even with your duvet do you still feel cold? A good Mattress Topper to use on top of the mattress and under the bottom sheet will help you feel, cozier warmer and happier! After buying one you will notice the difference, feeling not only warmer, but snugger and more protected. 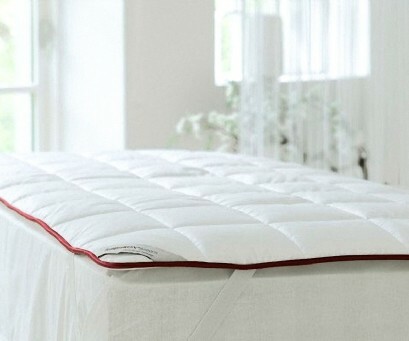 Besides, if you are a fan of natural products, our high quality down topper with its extreme softness and optimum comfort is the answer for you. Yes, you have come to the right place to buy extra comfort. The layer of soft, high quality down in our mattress toppers guarantees for you an incredible sense of comfort and coziness, helping to maintain the perfect temperature for the perfect night’s rest. Feeling warmth below you when you sleep makes sure you sleep well! The experts suggest: If you combine the Mattress Topper with one of our highly recommended down duvets - well, your double satisfaction and comfort is immediately guaranteed! Toppers There is 1 product.